I will be co-leading Birthing from Within’s signature Crossing the Threshold retreat in Las Vegas, February 1-3, 2019. Crossing the Threshold is a paradigm-shifting, heart-opening, burnout-busting workshop for anyone who works with or is interested in working with individuals and families in the childbearing year. My co-leaders will be BFW co-owner Erika Primozich and seasoned BFW facilitator Deidre Coutsoumpos. Join us! Contact me for a discount code that is valid until 1/20/19. 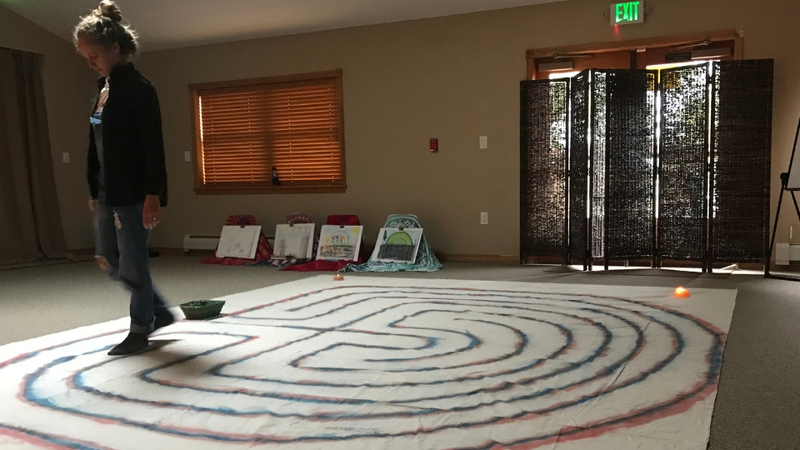 A Crossing the Threshold participant in Denver, CO walks the labyrinth. I am beyond thrilled to announce that I've been invited to present at the second Black Birth Matters conference! Black Birth Matters, which will take place in New Orleans on October 27, 2018, is the brainchild of the Birthmark Doula Collective, the New Orleans birth justice organization that was featured in the New York Times Magazine article about the crisis of maternal health disparities in the U.S. The conference theme is “Mind over Matter: Mental Health & Mothering,” with a focus on “holistic approaches to correct the poor maternal outcomes that plague Women of Color in the U.S.” My Birthing From Within colleague Deidre Coutsoumpos and I have designed a presentation that draws on a classic BFW process - the drawing and finger-tracing of labyrinths - and connects it specifically to the difficulties facing Women of Color in their childbearing years. Deidre and I are so excited to be participating in what we feel will be an historic event, and we hope to see you there!